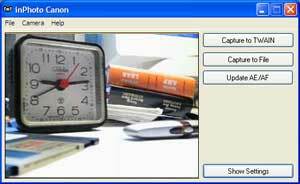 The inPhoto Capture software (Canon camera control) is designed for full control of Canon digital cameras from your personal computer. It can work as TWAIN driver or as the stand alone software. The program window view has two sections: the upper Image Preview area and the bottom Control Panel. In Preview area you can see the image to be captured. The preview image rate is 15 frames per second, and its size is 320x240 pixels. The Control Panel has two tabs: Settings and Profile. The Settings tab contains the drop-down lists used to control the Canon camera settings. The Profile tab contains the list of all User Profiles created. 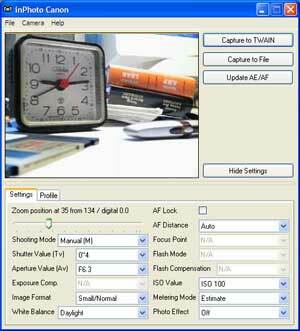 When you select all camera settings as you need for your application it is possible to minimize the inPhoto Capture software window by pressing Hide Settings button. The inPhoto Capture window will be minimized to Image Preview area. To restore the inPhoto Capture window press Show Settings and you will be able to change camera settings again and save them to User Profile if necessary.